Schumacher’s OBDII Memory Saver Detector attaches between a portable power unit and a vehicle’s on-board data (OBDII) diagnostic port, to maintain power to the vehicle’s on-board microprocessor controlled devices when the vehicle’s battery is disconnected for service or replacement. Fully automatic, this unit features a standard fuse protected auxiliary input plug, easy to follow 3 step instructions printed on unit, and auto detection will detect automatically if the vehicle’s electronics will allow this device to save on-board data. The LED indicators features: two yellow LEDs at each end to indicate that the OBDII port connection and the connection to the portable power unit are sound; and a red LED (do not proceed) or green LED (proceed) to indicate whether it is safe to remove or service the vehicle’s battery without fear of losing data stored in the vehicle’s microprocessor controlled devices. Works on all vehicles equipped with a standard on-board data (OBDII) port. The E-Z Red MS4000 is now equipped with a built in charger. 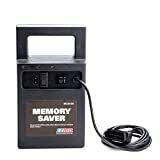 A 12 volt, 4.5 amp hour sealed lead acid battery is included inside the unit. The direct wired OBDII connector plugs directly into the vehicles OBDII port. The green LED indicates connection to circuit. The Amber LED indicates when the internal battery is 11.6 volts or lower and requires changing soon. The MS4000 saves all drive-ability codes and settings when disconnecting/changing a vehicle’s starter battery. It also protects settings and codes for anti-theft radios, clocks, keyless entry systems, and much more. The Professional Memory Saver is an effective solution for saving vehicle data. Saves the vehicle feets on-board diagnostic memory and other on-board memory components such as anti-theft radios, digital clocks, radio presets, seats, mirrors, comfort settings, etc. when the vehicle feets battery is removed or disconnected. Features an OBD II cable for fast connection to the vehicle, cigarette lighter adapter for use with vehicles that do not have an OBD II connector, LED lights confirm circuit between the cigarette lighter/power outlet and the vehicle feets battery with the ignition on or off, state of charge indicator identifies when the memory saver needs to be plugged in for recharge, resettable fuse protects against excessive current draw through either the OBD II connector or the vehicle feets cigarette lighter, high capacity rechargeable sealed lead acid battery for extended service between charges, power on/off switch, all in one complete and durable compact unit. Also includes in-line fuse and cigarette lighter input. 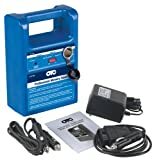 Roadpro 12-Volt Clip-On Battery Cigarette Lighter Adapter is manufactured to run 12 volt appliances by connecting directly to car battery terminals. It is constructed using durable material that ensures durability and longevity. It features a clip that attaches directly to the vehicle battery and facilitates quick as well as easy installation.